Hello, I'm looking for images or plans for tapered and parabolic top braces. I want a better starting point than I've been able to find so far. There a lot of photos out there and each is different by enough that I don't know where to start. I am probably overthinking again, but I would at least like to know a few basic things. The plans I have use thick scalloped braces and I don't want to do that. For your first (few) builds I would consider picking a guitar that you want to emulate (and you know works) and then finding plans for it (there are really lots of plans out there). Stay with a proven bracing scheme while get the rest of your building chops in order. Thank you. I'm using the Grellier plans for an OM. Many here have suggested that those plans are over braced and have recommended using tapered braces instead. I decided to do that and I'm just looking for some profiles to go by. Eric, I know your top is red cedar and that may influence the way you brace it. An experienced builder would tap and flex and do all that magic stuff, the rest of us just have to trust our instincts. 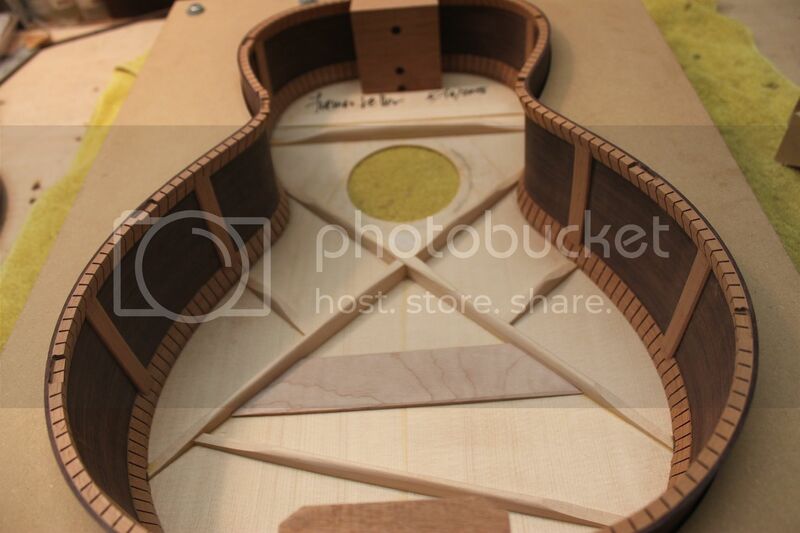 I haven't built with WRC (yet, I have a couple of top sets) but I would try to find a few guitars with cedar tops and poke around inside with a light and a mirror to get some idea of how they are braced. 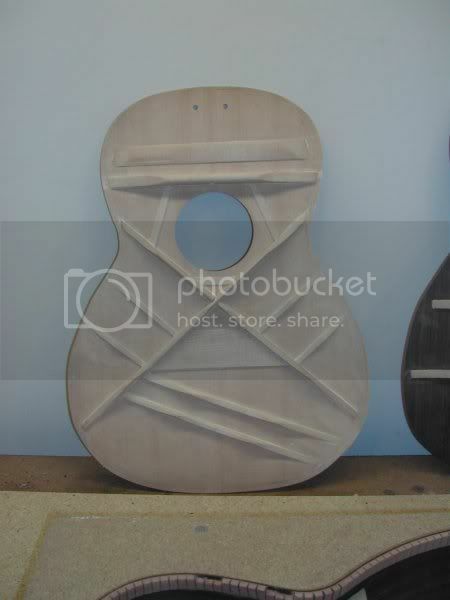 You might pose that question here - ask if anyone has pictures of guitars that they built with WRC tops (and what they were thinking as they braced them). I'll add a further anecdote - I own one of the "over build" Martins from the '70's - nice guitar but nothing outstanding. A few years ago I sent it off to a person who is known for after market scalloping - he replaced the heavy rosewood bridgeplate with a smaller maple one and did some brace work thru the soundhole. It made a definite difference in the guitar - when I got it back my wife commented that I was playing louder. Use the basic bracing pattern in the plans, but make the braces thinner and taller with a triangular cross-section. Brace up the top and tap all over the place and notice how dead it all sounds. Start carving away at the braces, tapping as I carve. At some point the top will start to sound more lively. Keep carving and tapping but after the top starts to sound lively, also start flexing the top a bit. Stop carving when I start to get apprehensive about how much the top is flexing. You might do a search over on UMGF for interior shots of 1945-1946 Martin production - the exemplar of tapered (aka as parabolic, despite the lack of any parabolas) bracing was the 1945 D-18...IMO, the best balanced larger body Martins made (focused and more uniform presentation versus big, soft bottom end and scooped mids of the earlier D's). Also nothing like building more than one - vary the bracing and learn something you would not otherwise. We get into this nonsense of 'modern' versus 'old fashioned' practices, only to find that what we thought was modern is an old approach that was used for decades, then fell out of favor. Make your own decisions about the tone that appeals to you...build more guitars. Todd Stock wrote: You might do a search over on UMGF for interior shots of 1945-1946 Martin production - the exemplar of tapered (aka as parabolic, despite the lack of any parabolas) bracing was the 1945 D-18...IMO, the best balanced larger body Martins made (focused and more uniform presentation versus big, soft bottom end and scooped mids of the earlier D's). Thanks, Todd. I went over there and found a bunch of interior shots of braces. There is a lot of variation in both shape and fit and finish. Some look like furniture and others look like they were made with an axe and thrown in with bubble gum. Very interesting. Todd Stock wrote: Also nothing like building more than one - vary the bracing and learn something you would not otherwise. We get into this nonsense of 'modern' versus 'old fashioned' practices, only to find that what we thought was modern is an old approach that was used for decades, then fell out of favor. Make your own decisions about the tone that appeals to you...build more guitars. This is my hope. I need to get the first one done to get a feel for the whole process and to get all the jigs and tools together. Then I will be able to try things. I'm not sure what to do with guitars I make and I don't think I can bring too many more into the house. Excellent! And never discount the ability to find a home for your projects...have a student building his first two as solo projects...for his kids. I am betting that you'll have paying customers by the time you run out of friends and family. willing to take a guitar off your hands. "Some look like furniture and others look like they were made with an axe and thrown in with bubble gum. Very interesting." And some of the most sought after guitars are on the axe and bubblegum end of the thing. 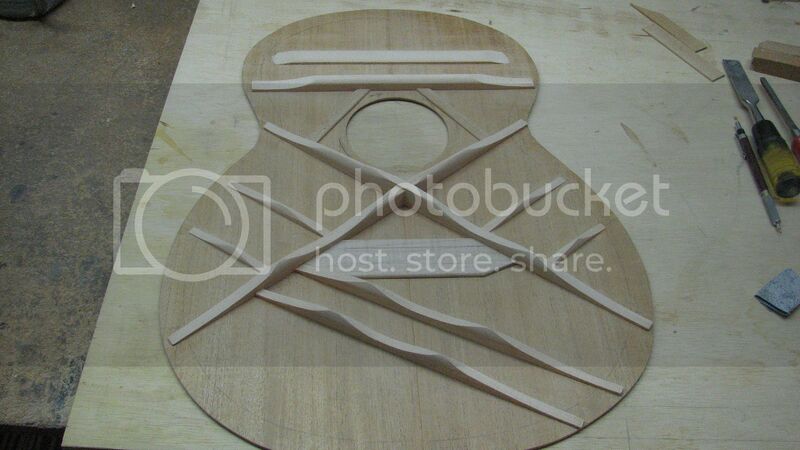 With even a modicum of skill it's really hard to build a "bad sounding" guitar. The truly awful instruments are the ones that are unplayable because of fretting or action issues. Some of the old boxes have braces that were left square and still have saw marks on them, and they still sound good. So just take the Nike approach (just do it) and if it doesn't work out take the other Nike approach (blow it up). I'm willing to wager lunch that you'll make something that you'll be proud of. ps. the one thing that I insist on my braces is that they're freshly split--but then again, I've only built two guitars and a ukulele. Pretty much everyone else has more experience than me. If you're at all sensitive to the properties of the wood you're working with there will likely be some variation in the brace profiles when you're done. Top wood and brace stock can vary quite a lot, so getting the tap tones or flexibility the same will call for different brace heights and even profiles from one guitar to the next. Factories make them all the same, and accept the variation in tone.